On narrow roads, winding through groves, where trees bend under the weight of oranges, and lavender fields are located, tourists arrive in the French city of Avignon. The Pope, the theater and the famous children's song dedicated to the Avignon Bridge are the first associations associated with this city. And, although today only about 100 thousand people live in Avignon, the population of the annual summer festival is increasing, almost 4 times. And then the city represents one giant scene in the open air. The spectators are called to their hundreds by hundreds of different and competing actor's troupes. The echo, practically, in all the languages ​​of the planet, is carried along the rumbling river of the Rhone. Comedy del arte, classical tragedy and pantomime - there are no genres at the festival! As already mentioned above, numerous foreign guests come to the Avignon Festival. July in this part of the country is considered particularly hot, but to sleep at night under the open sky, yet, it is not worth it. Why risk it? And, if so, then about booking the hotel should take care beforehand. If this is not possible, then after the day activities of the festival you can go to the surrounding towns and look for places to sleep there. 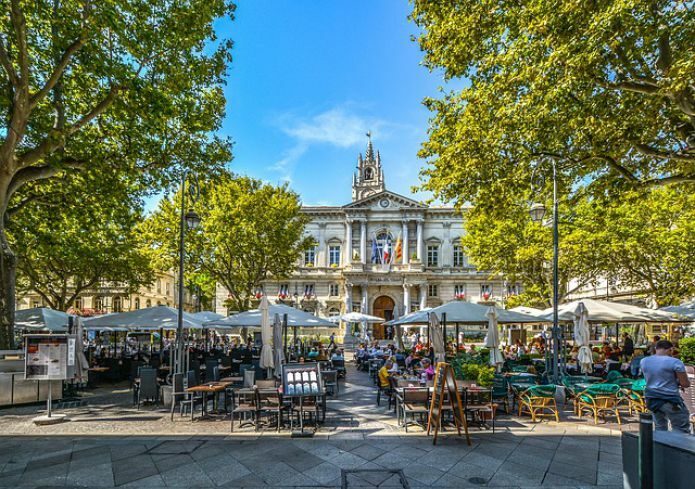 Those of the foreign tourists who come to Avignon not in peak season, directly, on site will find all the addresses of the hotels. The street Chur Jean Jaures is especially loved by foreign travelers. Here is a tourist office, ready to help any tourist who finds himself in a difficult situation. More than 130 thousand tickets are sold annually during the festival. In many performances, you can even participate for free. I wonder if any of the guests of the festival know that before the 18th century there was not even a theater building in Avignon. The first in 1734 arose the Comedy Theater, which is located on the current square called Crillon. On the square of Orloz is the most famous, to date, City Theater, founded in the 19th century. His building with no other confusing is simply impossible, because on its facade depicts Apollo, and next to it there are monuments to Corneille and Moliere. In the walls of the once functioning monastery of St. Clare now houses the Theater de Gaulle. They say that it was in this place that the great Petrarch met Laura, who dedicated his most famous poems about love. The city of Avignon is so magnificent that even those who did not get to the annual festival will not be disappointed, having arrived here at another time.